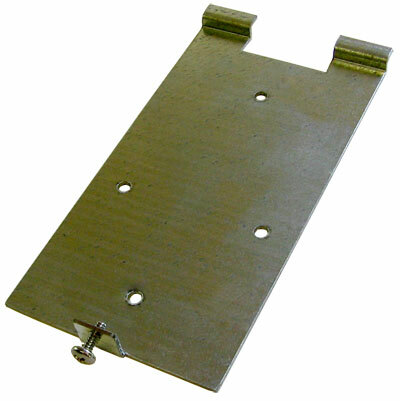 This steel mounting plate for TimePilot Vetro simplifies hanging the clock on the wall and provides some security. The plate mounts to a wall with the two wall anchors and screws included with your Vetro clock. Two hooks at the top of the plate fit indentations on the back of the Vetro clock and the clock is secured to the plate with a screw at the bottom of the assembly. When the clock is secured to the plate, the screw is hidden from casual view. Measures 5 inches by 2.5 inches, zinc coated. Contains four holes in a diamond pattern. TimePilot Corporation warranty*: For one year after you purchase a TimePilot Vetro Mounting Plate, we will repair or replace (at our discretion) any malfunctioning hardware. The purchaser pays only the shipping to return the malfunctioning part to us.